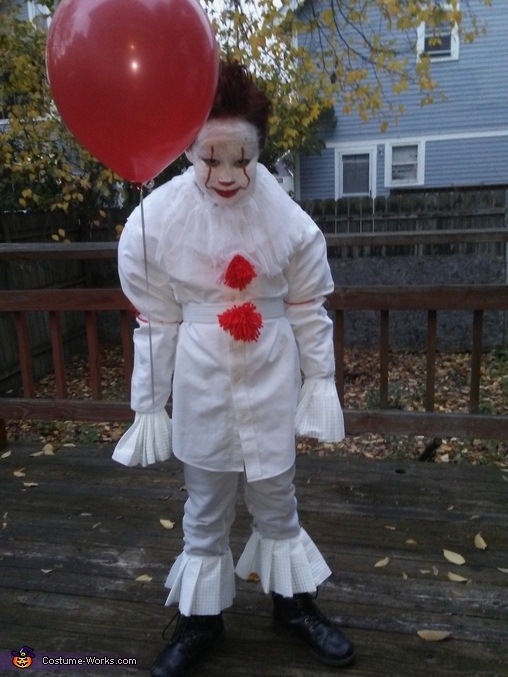 My 8 year old son, Isaiah, decided he wanted to be Pennywise this year, after watching the movie "IT". After looking online, I realized they were not selling the costumes. The only ones I could find of the new 2017 version of Pennywise, were on EBay for hundreds of dollars. So I decided to make the costume instead. I picked up pieces here and there. Thrift stores, Walmart, JoAnn Fabrics. We used a button up shirt, and bought fabric for the ruffles around the bottoms of the sleeves and pants. We made the red pom poms out of yarn. I bought Halloween makeup and orange hair dye (spray that washes out with one wash). In total, I spent around $23 to create this look. He loved it and I was so happy with how it turned out.